If you already own a pressure cooker but do not yet have a pressure cooker basket, then we strongly encourage you to invest in one! Steamer basket inserts can be used to prepare fruit, vegetables, fish, and even eggs! When purchased new, most modern pressure cookers will come with a simple steamer basket insert; however, there are many different types of baskets to choose from including compartmentalized baskets and multi-level baskets. These basket types can be used to cook multiple different foods at one time. The foods that require the most time to cook should be placed at the bottom of the basket–closest to the heat source, and items that require the least amount of cooking time should be placed at the top of the basket. Traditionally, water is used for steaming foods, but did you know that you can flavor the water that you steam your food with? Common additives include wine, herbs, and vinegar. Alternately, you can also use broth or even tomato sauce to cook your food. If you choose to go this route, then you can use the steaming liquid as a sauce for the food. Steam does impart a small amount of flavor to the food you are cooking it with, but it is minimal. The liquid that you use to steam your seafood or vegetables can be saved and safely stored in your refrigerator for up to a week. The stock can be used to cook other delicious dishes. If your pressure cooker does not have its own perforated insert, then you should consider investing in a collapsible stainless steel steamer. This type of steamer insert opens and closes like a flower, and it is preferable to choose one made of stainless steel since it is durable and resistant to rust and corrosion. These steamers are available in multiple sizes. You should choose the largest available one that will fit your pressure cooker. This maximizes the amount of flat surface available to cook food on. The center “stem” of the flower-like basket should be removable, so you can move it if you want to steam a single large dish. If your pressure cooker was accompanied by a perforated insert, then it most likely came with a trivet. You should always use the trivet in conjunction with your steamer basket because most steamer baskets that are made by the manufacturer are not equipped with feet to keep the basket raised out of the steaming liquid. 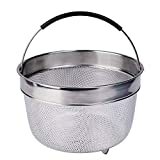 If you’re in a bind and do not have a steamer basket insert on hand, a wire mesh basket or a colander crafted from heatproof material will work in a pinch. 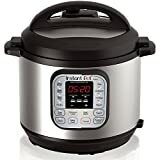 Electric pressure cookers that have non-stick interiors should only be used in conjunction with silicone steamer baskets. Metal baskets will scratch the interior lining of the pressure cooker. PREMIUM MATERIAL: Made from durable, high-quality, food-grade stainless steel that won't rust. 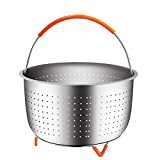 EASY TO USE: It's easy to lift & remove steamer basket from the pot with the silicon handle. VERSATILE: Great for steaming eggs and vegetables in 6Qt Instant Pot DUO60, Ultra 60, LUX60V3, DUO Plus 60 or Power Pressure Cooker XL. If you use a pressure cooker in your kitchen regularly, then having a steaming basket or even a silicone steamer basket is always a good idea because it allows you to cook a variety of foods that are elevated, rather than sitting directly on the surface of the inner pot. They are also usually dishwasher safe like most pressure cooker models, so you don't have to worry about excess cleanup following your meal. Elevation like this allows for a calmer cooking environment and allows you to make more delicate foods much easier. It is also good for foods that you don't want sitting in the liquid in the base of the pot; for example, when you make certain desserts. Cooking Eggs. This is a delicate food, and you don't want them sitting in the bottom of the inner pot and able to move around and become broken. The basket allows you to cook hard-boiled eggs without the frustration of them rocking and breaking under the pressure. Vegetables. 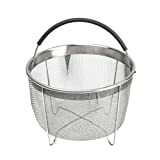 If you have tougher vegetables you want to cook, then the steamer basket can help. It elevates them above the liquid, so the veggies don’t soak it all up from sitting in it. Potatoes are a good example of when to use the steamer basket. For Baking. When you are making desserts like cakes or cheesecake, or you want to try your hand at baking bread in your pressure cooker, then the steamer basket comes in handy again to keep the food above the water or other liquid. So, the next time you want to cook a meal and steam veggies, consider using a pressure cooker steamer basket. You can find baskets that are stainless steel, very compact, and can be easily adjusted to fit the interior of your pressure cooker. Many of them are also compatible with several of the more popular pressure cooker models.